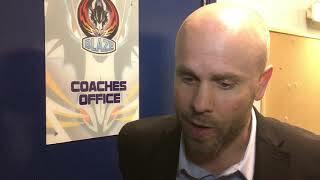 The Genting Casino Coventry Blaze lost their place in the Challenge Cup as former academy product Adam Goss stole the show to give his current side Milton Keynes Lightning a 1-2 victory at the Skydome Arena. After a long trip back from Glasgow, Coventry went into the must win cup game without long term absentees Miika Wiikman and Ross Venus, plus American Shawn Pauly who was added to the injury list. MK, who sprang the surprise start of Goss over usual number Partick Killeen were also heavily depleted but got off to the perfect start with Tim Wallace registering on the powerplay at 5.44. It took some time, but Coventry finally beat the inspired Goss at 26.32, Norwegian defenceman Nicolai Bryhnisveen scoring on home ice for the third straight time. The game wasn’t tied for long though as Swede Andreas Valdix found space in front of the Blaze net beating Miroslav Kopriva for 1-2 on 28.56. 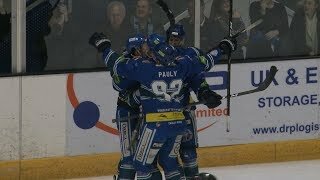 Try as they might, with a total of four powerplay opportunities and 37 shots including several grade A scoring opportunities, Coventry could not find another way past Goss, leaving them with a frustrating 1-2 defeat and their Challenge Cup hopes dashed.